The University of the District of Columbia’s Web Services team is responsible for the oversight, strategic creation, and maintenance of the online identity of the university. To this end, we employ varying technologies, keep abreast of emerging technologies, engage in social media, and manage day-to-day electronic communication functions. Turnaround times are typically three days for basic web content updates, if all requirements are confirmed. For larger projects, the turnaround time varies based on complexity and resources. Please contact us as soon as possible in order to schedule your project. Also, be sure to check out our How to Create Web Content guide as well as our web page on Requesting a Web Update. Find out more about our websites at our web page, the UDC Websites. 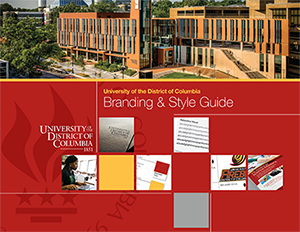 For a comprehensive listing of UDC’s social media presence, please visit our UDC Social Media Directory web page. You may also request to be added to the directory on the UDC Social Media Directory web page, as well as find a link to our Social Media Guidelines. UDC’s Communication function is officially handled by the university’s Office of External Affairs. We send out relevant notices through the UDC-Communications email account as well as assist with HTML emails to external audiences. We are also responsibile for all web, AV screens, and social media postings. It is currently university policy to only utilize the UDC-Communications email account for high-level communications, such as board meetings/agendas, emergency notifications, system outages, procurement deadlines (i.e. closing and opening of the budget), and new system implementations (i.e. Banner, Blackboard Analytics, myUDC). All other notices and communications will be posted to the internal myUDC Portal. Read more about the guidelines at the Communication Channels web page. We also keep the public display monitors updated at all times.